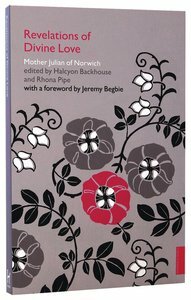 ^^In 1373, when she was thirty years old, Julian of Norwich received a series of sixteen visions. Pondering in prayer their meaning for twenty years, she gradually came to realise their full significance. ^^Written from the heart and borne from experience, Julian's Revelations of Divine Love is inspiring reading for all who seek to live their lives in close union with God. Her reflections are steeped in the Bible, contain many profound insights into contemplative prayer and are as relevant today as when they were originally written. ^^The greatest of the female mystics and a spiritual guide for today, Julian additionally holds the distinction of being the first woman to write a book in the English language. ^^This new edition includes an introduction that sets Julian in the context of her time, and a foreword by Jeremy Begbie. About "Revelations of Divine Love (Hodder Classic Series)"